Claude Elwood Shannon (April 30, 1916 – February 24, 2001) was an American mathematician, electrical engineer, and cryptographer known as "the father of information theory". Shannon is noted for having founded information theory with a landmark paper, A Mathematical Theory of Communication, that he published in 1948. He is also well known for founding digital circuit design theory in 1937, when—as a 21-year-old master's degree student at the Massachusetts Institute of Technology (MIT)—he wrote his thesis demonstrating that electrical applications of Boolean algebra could construct any logical numerical relationship. Shannon contributed to the field of cryptanalysis for national defense during World War II, including his fundamental work on codebreaking and secure telecommunications. In 1948, the promised memorandum appeared as "A Mathematical Theory of Communication", an article in two parts in the July and October issues of the Bell System Technical Journal. This work focuses on the problem of how best to encode the information a sender wants to transmit. In this fundamental work, he used tools in probability theory, developed by Norbert Wiener, which were in their nascent stages of being applied to communication theory at that time. Shannon developed information entropy as a measure of the uncertainty in a message while essentially inventing the field of information theory. In 1949 Claude Shannon and Robert Fano devised a systematic way to assign code words based on probabilities of blocks. This technique, known as Shannon-Fano coding, was first proposed in the 1948 article. The book, co-authored with Warren Weaver, The Mathematical Theory of Communication, reprints Shannon's 1948 article and Weaver's popularization of it, which is accessible to the non-specialist. Warren Weaver pointed out that the word "information" in communication theory is not related to what you do say, but to what you could say. That is, information is a measure of one's freedom of choice when one selects a message. Shannon's concepts were also popularized, subject to his own proofreading, in John Robinson Pierce's Symbols, Signals, and Noise. Outside of Shannon's academic pursuits, he was interested in juggling, unicycling, and chess. He also invented many devices, including a Roman numeral computer called THROBAC, juggling machines, and a flame-throwing trumpet. One of his more humorous devices was a box kept on his desk called the "Ultimate Machine", based on an idea by Marvin Minsky. Otherwise featureless, the box possessed a single switch on its side. When the switch was flipped, the lid of the box opened and a mechanical hand reached out, flipped off the switch, then retracted back inside the box. In addition, he built a device that could solve the Rubik's Cube puzzle. After suffering the progressive declines of Alzheimer's disease over some years, Shannon died at the age of 84, on February 24, 2001. ^ James, I. (2009). "Claude Elwood Shannon 30 April 1916 – 24 February 2001". Biographical Memoirs of Fellows of the Royal Society. 55: 257–265. doi:10.1098/rsbm.2009.0015. ^ a b c d e "Bell Labs Advances Intelligent Networks". Archived from the original on July 22, 2012. ^ "Claude Shannon". nyu.edu. Retrieved September 10, 2014. ^ Sloane, N.J.A; Wyner, Aaron D., eds. (1993). Claude Elwood Shannon: Collected Papers. Wiley/IEEE Press. ISBN 978-0-7803-0434-5. Retrieved December 9, 2016. ^ William Poundstone (2010). Fortune's Formula: The Untold Story of the Scientific Betting System. Macmillan. p. 18. ISBN 978-0-374-70708-8. Shannon described himself as an atheist and was outwardly apolitical. ^ Robert Price (1982). "Claude E. Shannon, an oral history". IEEE Global History Network. IEEE. Retrieved July 14, 2011. ^ a b Claude Shannon, "A Symbolic Analysis of Relay and Switching Circuits," unpublished MS Thesis, Massachusetts Institute of Technology, August 10, 1937. ^ Shannon, C. E. (1938). "A Symbolic Analysis of Relay and Switching Circuits". Trans. AIEE. 57 (12): 713–723. doi:10.1109/T-AIEE.1938.5057767. hdl:1721.1/11173. ^ Gardner, Howard (1987). The Mind's New Science: A History of the Cognitive Revolution. Basic Books. p. 144. ISBN 978-0-465-04635-5. ^ C. E. Shannon, "An algebra for theoretical genetics," (Ph.D. Thesis, Massachusetts Institute of Technology, 1940), MIT-THESES//1940–3 Online text at MIT — Contains a biography on pp. 64–65. ^ Okrent, Howard; McNamee, Lawrence P. (1970). "3. 3 Flowgraph Theory" (PDF). NASAP-70 User's and Programmer's manual. Los Angeles, California: School of Engineering and Applied Science, University of California at Los Angeles. pp. 3–9. Retrieved March 4, 2016. ^ David A. Mindell, Between Human and Machine: Feedback, Control, and Computing Before Cybernetics, (Baltimore: Johns Hopkins University Press), 2004, pp. 319-320. ISBN 0-8018-8057-2. ^ David Kahn, The Codebreakers, rev. ed., (New York: Simon and Schuster), 1996, pp. 743–751. ISBN 0-684-83130-9. ^ quoted in Erico Marui Guizzo, "The Essential Message: Claude Shannon and the Making of Information Theory," Archived May 28, 2008, at the Wayback Machine unpublished MS thesis, Massachusetts Institute of Technology, 2003, p. 21. ^ Shannon, Claude (1949). "Communication Theory of Secrecy Systems". Bell System Technical Journal 28 (4): 656–715. ^ Wolfram, Stephen (2002). A New Kind of Science. Wolfram Media, Inc. p. 1069. ISBN 978-1-57955-008-0. ^ a b Weisstein, Eric. "Shannon, Claude Elwood (1916–2001)". World of Scientific Biography. Wolfram Research. 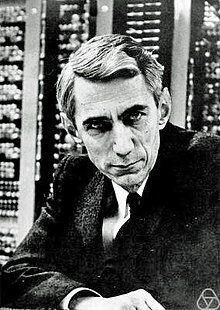 ^ "Claude Shannon – computer science theory". www.thocp.net. The History of Computing Project. Retrieved December 9, 2016. ^ "People: Shannon, Claude Elwood". MIT Museum. Retrieved December 9, 2016. ^ Jimmy Soni; Rob Goodman (2017). 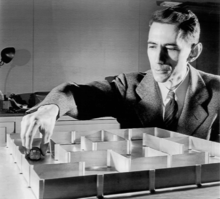 A Mind At Play: How Claude Shannon Invented the Information Age. Simon and Schuster. pp. 63, 80. ^ "Betty Shannon, Unsung Mathematical Genius". Scientific American Blog Network. Retrieved July 26, 2017. ^ Johnson, George. "Claude Shannon, Mathematician, Dies at 84". Retrieved October 4, 2018. ^ "Claude Shannon Statue Dedications". Archived from the original on July 31, 2010. ^ George Dyson (July 21, 2017). "The Elegance of Ones and Zeroes". Wall Street Journal. Retrieved August 15, 2017. ^ Katie Reilly (April 30, 2016). "Google Doodle Honors Mathematician-Juggler Claude Shannon". Time. ^ Menchie Mendoza (May 2, 2016). "Google Doodle Celebrates 100th Birthday Of Claude Shannon, Father Of Information Theory". Tech Times. ^ "Google Doodle commemorates 'father of information theory' Claude Shannon on his 100th birthday". Firstpost. May 3, 2016. ^ Jonathan Gibbs (April 29, 2016). "Claude Shannon: Three things you'll wish you owned that the mathematician invented". The Independent. ^ David Z. Morris (April 30, 2016). "Google Celebrates 100th Birthday of Claude Shannon, the Inventor of the Bit". Fortune. ^ a b Claude Shannon (1950). "Programming a Computer for Playing Chess" (PDF). Philosophical Magazine. 41 (314). ^ Dr. James Grime. "How many chess games are possible? (films by Brady Haran). MSRI, Mathematical Sciences". Numberphile, July 24, 2015. ^ "Newsletter". IEEE Information Theory Society. IEEE. June 2015. ^ "Newsletter". IEEE Information Theory Society. IEEE. September 2014. ^ "Shannon Centenary". IEEE Information Theory Society. IEEE. ^ "Shannon's centenary US postal stamp". ^ "-George Boole 200-Conferences". Archived from the original on September 6, 2015. Retrieved September 21, 2015. ^ "Compute and Communicate – A Boole/Shannon Celebration". ^ Geocaching. "GC6ACQE Shanniversary #1: Information Theory (DE/EN) (Traditional Cache) in Bayern, Germany created by sigurd_fjoelskaldr". ^ "Saving Face: Information Tricks for Love and Life (Math Encounters Presentation at the National Museum of Mathematics". ). ^ Roberts, Siobhan (April 30, 2016). "Claude Shannon, the Father of the Information Age, Turns 1100100". The New Yorker. Retrieved April 30, 2016. ^ "IEEE Morris N. Liebmann Memorial Award Recipients" (PDF). IEEE. Archived from the original (PDF) on March 3, 2016. Retrieved February 27, 2011. ^ "Claude Shannon". National Academy of Sciences. July 2, 2015. Retrieved March 25, 2019. ^ "IEEE Medal of Honor Recipients" (PDF). IEEE. Archived from the original (PDF) on April 22, 2015. Retrieved February 27, 2011. ^ "C.E. Shannon (1916–2001)". Royal Netherlands Academy of Arts and Sciences. Retrieved July 17, 2015. ^ "Award Winners (chronological)". Eduard Rhein Foundation. Archived from the original on July 18, 2011. Retrieved February 20, 2011.